ASTROgirl! 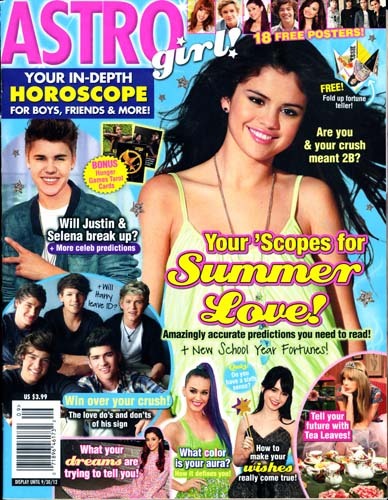 Magazine is an astrology-based celebrity teen magazine published by Bauer Publishing. I bet a lot of my teenage fans are loyal readers. Well, in their upcoming issue (due out in December, 2012) there is an article on the “World’s Most Talented Pets.” And, you guessed it! I’m one of them. Of course, I’m also a celebrity, and that’s probably the real reason they wanted to include me. 🙂 Keep an eye out for the magazine. I know I will. They also publish Twist Magazine. Concatulatious for the press, Nora! You are a real celebrity Nora and deserve to be there! Purr. Forget Brad and Angelina…we want more Nora!